In 1991 my all time favorite wrestler Ric Flair jumped WCW's ship and landed in the WWF. His first feud there was with "Rowdy" Roddy Piper, which led to a Survivor Series encounter. I really liked both teams that were assembled in this contest, however, I was not a fan of how the match went down. 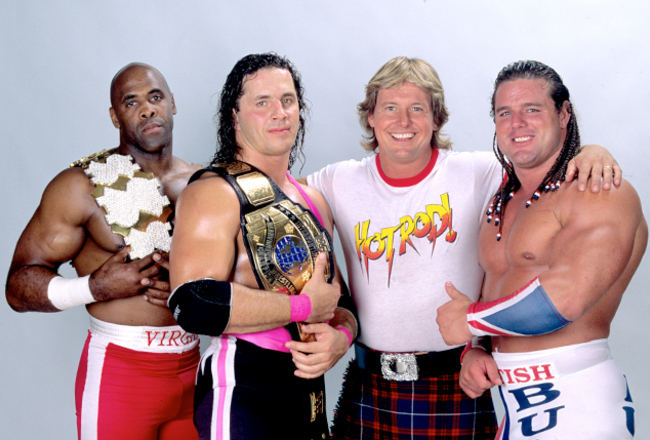 Piper was joined by Virgil, Davey Boy Smith and Bret Hart. Flair's team consisted of the Mountie, the Warlord and the "Million Dollar Man" Ted DiBiase. However, since I'm picking ONE team per blog and not picking teams from the same year, I'm going with Piper's team. Flair was my favorite, however, I wasn't so high on the Warlord or the Mountie. Bret and the Bulldog were awesome along with Piper. Virgil was the weak link there in terms of my fandom. This match started off great with Flair getting some experience with some of the WWF's top guys in the first few minutes. In a surprise move, Bulldog was the first to be eliminated when he was pinned by Flair. Piper's team even the score when Hot Rod pinned the Warlord. But then chaos ensued and everyone but Flair was disqualified for brawling. 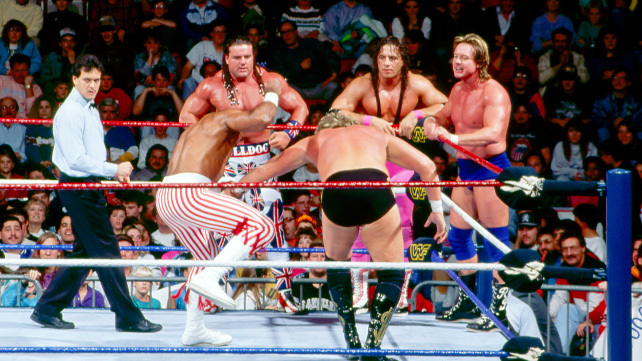 This wasn't the first time a Survivor Series match went this way. I don't like when they do that. It's a lazy way to eliminate guys. But there's no doubt this was the match with the most talent on the roster at that time. This could have been a good opportunity to let Flair shine as he was a couple of months away from winning the WWF Title. Beating Bulldog, Hart, Virgil and Piper in the same match would have been a testament to his greatness, but I will admit I'm biased. At least Naitch ended up being the sole survivor here. Wooo!